The 'resource curse' is the view that countries with extensive natural resources tend to suffer from a host of undesirable outcomes, including the weakening of state capacity, authoritarianism, fewer public goods, war, and economic stagnation. This book debunks this view, arguing that there is an 'institutions curse' rather than a resource curse. Legacies endemic to the developing world have impelled many countries to develop natural resources as a default sector in lieu of cultivating modern and diversified economies, and bad institutions have also condemned nations to suffer from ills unduly attributed to minerals and oil. 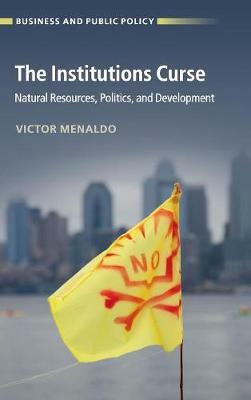 Victor Menaldo also argues that natural resources can actually play an integral role in stimulating state capacity, capitalism, industrialization, and democracy, even if resources are themselves often a symptom of underdevelopment. Despite being cursed by their institutions, weak states are blessed by their resources: greater oil means more development, both historically and across countries today.